With the proper adapters, Thunderbolt has the ability to support many types of peripheral connections (including HDMI, USB, FireWire, Fibre Channel and more). In addition to storage devices, you can connect Mini DisplayPort displays, such as Apple’s LED Cinema Display. Our initial tests with the Thunderbolt-equipped 12TB R6 found that it is considerably faster than similar devices we’ve tested—devices that use FireWire, USB, or both. The R6 is Thunderbolt-only, so we couldn’t isolate the performance differences of the connection by testing the R6 with a different interface. As a point of reference, we compared the R6 to another Promise RAID array, the $799 SmartStor DS4600 with four 1TB drives (unfortuantely, we don't have access to an array that's similar to the R6). 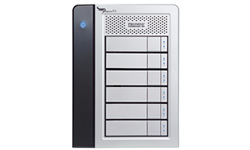 The R6 and DS4600 were tested as RAID 5 devices.